If you have a cat and you're looking to purchase a new litter box, you may have noticed that there are a plethora of options, which can be confusing. But if choosing the right litter box overwhelms you, fear not, because we've broken down the pros and cons of the six most common types of litter boxes. High sided litter pan: A basic pan litter box, often made of plastic, with high sides. Pros: This type of litter box is basic and very affordable. The high sides help prevent litter from spreading, can hold a lot of litter, and are good for older or disabled cats that may have trouble climbing. Cons: These litter boxes don't prevent litter tracking well, and if you have dogs, this type is easy for them to access. 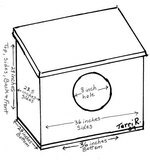 Top entry litter box: a litter box with a lid and a small entry at the top. Pros: This type of box is especially good for decreasing litter tracking because of the top exit, and because a lot of lids have grooves that trap litter particles from the cat's paws. This litter box also helps contain spraying, keeps dogs out, can help contain odor, and offers your cat privacy. Cons: These litter boxes are slightly more expensive, and are not good for cats with disabilities or older cats that may have trouble climbing. Hooded litter pan: a pan litter box with a usually-detachable hood, and entry through the front. Pros: This type of litter box helps contain litter, which cuts down on tracking. It has a versatile design, as the hood can be taken off if your cat doesn't like it. It also offers your cat privacy, and is good for disabled or senior cats. Cons: This type can come with a higher price tag, and it doesn't prevent dogs from getting into the litter. Pros: These litter boxes are cheap and are usually landfill-safe. They're designed for simple cleanup and for travel, and the baking soda helps with odor control. Cons: These litter boxes, by nature, requires you to purchase them over and over. This can be a pain, and is less environmentally friendly than other types of litter boxes. They're also easy for dogs to get into. Scoop-free automated litter box: a high-tech litter box that uses sensors to rake litter and remove cat waste so you don't have to. This category includes the famous Litter Robot, which looks like a spaceship and is billed as an "automatic self-cleaning litter box." Pros: These amazing litter boxes make for super easy clean up, as all you have to do is replace the tray. You can also track how many times your cat uses the litter box, if you have any health concerns about your cat. Cons: These are significantly more expensive than other litter boxes, and might require special litter. Hidden litter box: a litter box disguised as a piece of furniture, often an end table. Pros: This type of litter box is stylish and discrete. These litter boxes usually decrease tracking, as they normally have some type of lid. Cons: It could be tough to remove waste, depending on the model. As a rule, you should have as many litter boxes as you have cats, plus one. So it may be cost-effective to mix and match what kinds of pan you buy for your cat. Try a few out, and see what works best for your cat's needs, and your personal tastes and lifestyle.